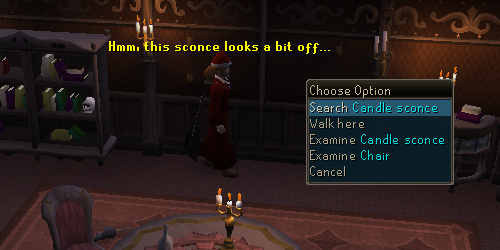 Draynor Manor is that old mansion that stands just north of Draynor Village. Once there you will find spooky things such as attacking trees and vampires! Of course, there's also the occasional quest to be started or completed in there. There are just so many things to do. However, there is always a lack of people...so be on guard. 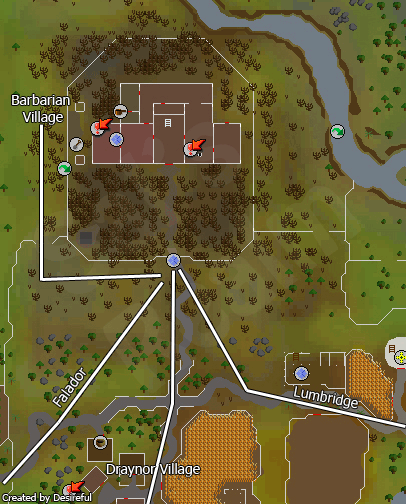 Members may use an Amulet of Glory to teleport to Draynor Village. From there, simply walk north. Walk south from Barbarian Village. 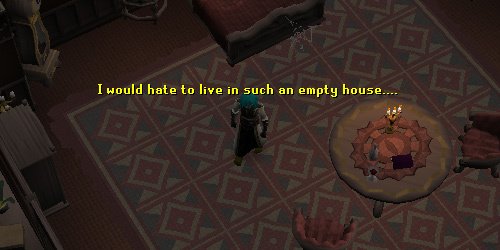 You've made it to Draynor Manor. Go through the front gate and through the forest of dead trees. Be careful, though, some of the trees attack! They won't cause too much damage, so don't be too concerned. If you are concerned, just run through the path until you get to the front door. When you get to the door, you will be presented with a message that you won't be able to leave through these doors if you go through them. 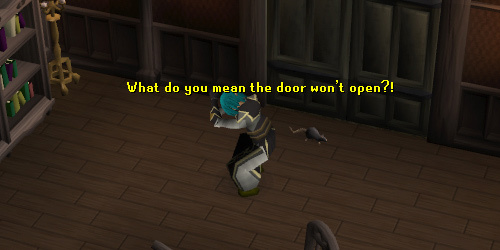 If you wish to proceed, press "Yes", and you will go through the door. Otherwise, press "No" and leave. Leaving the manor will be explained later on in the guide. 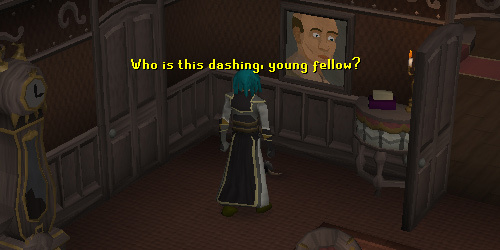 Welcome to Draynor Manor. The home of many quests and, of course, a vampire. Why come into the manor? 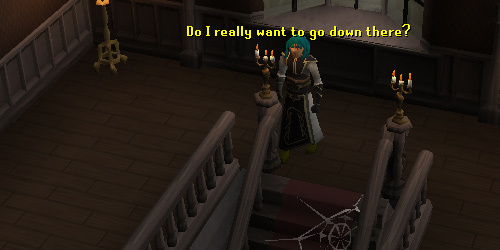 You can start the members only quest, Animal Magnetism, or complete the Ernest the Chicken quest, which you start by talking with Veronica just outside of the mansion. A part of the Vampire Slayer quest also takes place in the manor as well. So you decided to venture indoors. As you can see, the place is rather vacant. The wardrobes are empty, even the cobwebs seem to be missing spiders! There are several directions you can go from here: there are several doors, plus a giant staircase directly to the north. If you head into the room to the west, you will immediately be followed by a chair or two. This obviously adds to the 'spooky' factor. Besides the harmless chairs, the room serves no purpose aside from giving access to other rooms in the house. If you head north from the previous room, you will find yourself in the main room of the house. There are, of course, chairs that follow you along with the usual furnishings. There's a grand piano and a large dining room table for the inhabitants to eat upon. It's essentially a corridor to other rooms in the house. 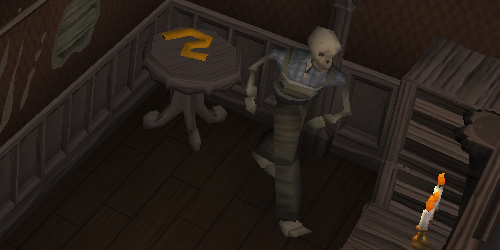 In this small room, you can find a skeleton wandering amongst its belongings. Empty crates, empty barrels - the necessities for every skeleton to have! In the corner there is also a Rubber Tube which you need in the Ernest the Chicken quest. In the most northwestern point of the house, you can find the place where a witch resides. 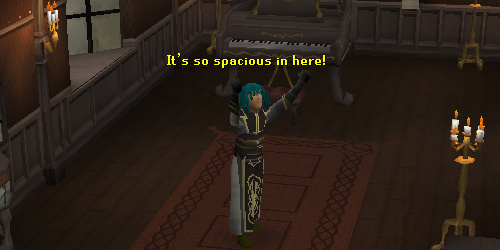 There are potions, herbs, and a quaint range to cook things on. Directly south of this room you can find a bottle of poison, an item that is used in the Ernest the Chicken quest. Just east of the entrance you can find a staircase leading down to the basement. Downstairs takes part of the Vampire Slayer quest. There is a vampire down there that you must kill. 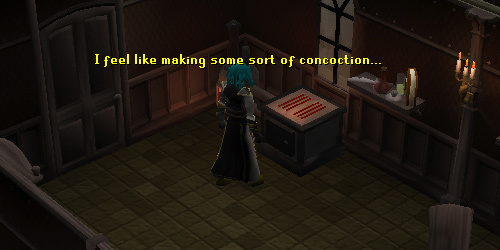 Obviously if you completed the quest, the vampire no longer exists, and if you go downstairs and open the coffin, you will find that it is empty. Inside this room is the door out of the manor. 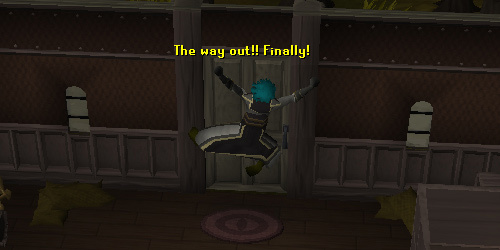 You can't come back in this way, so be sure you really want to leave! 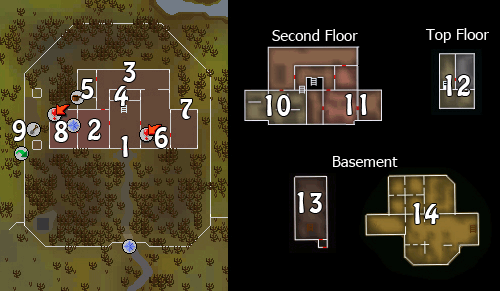 You can also find a spade, bucket, and bronze medium helmet respawn in the room. Aside from the empty shelves and bookcases, the exit is the main attraction. 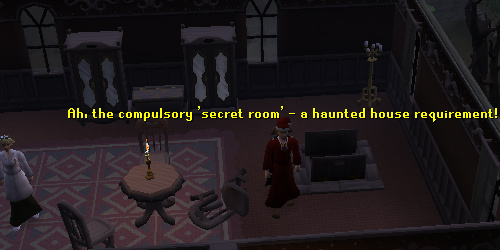 Like all good spooky houses, there must be some sort of secret room, right? This may not be as secret as one might think, but it doesn't have a door. That counts right? You just need to search the Candle Sconce and the wall will open, allowing you to go in. Inside you can start Animal Magnetism, a members only quest. To start, just talk with Ava. To leave, just pull the bronze lever on the wall. If you're a member, and you've completed the Animal Magnetism quest, you can access Ava's shop, known as Ava's Odds and Ends. One of the attractions outside the manor is the Farming patch! It's an evil turnip patch, dedicated for all your evil turnip needs! To the south there is a compost heap to help with farming, obviously. There are also several rows of cabbages. Be careful! 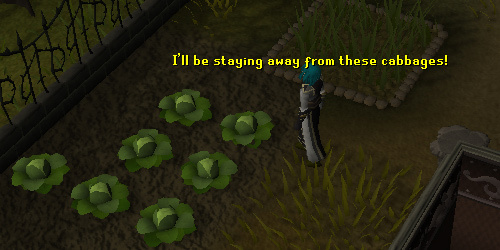 These cabbages will NOT assist you in the Black Knight's Fortress quest. Also, they give you a +1 Defence bonus. 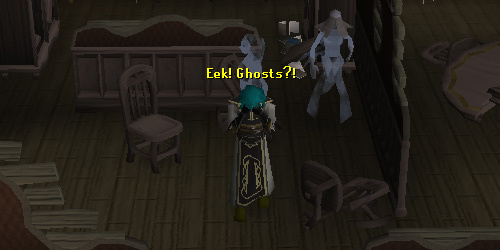 The house really is haunted! In this area, you can find level 19 Ghosts. There you can attack them and they are a great way to train your combat if you are at a lower level. There are more empty rooms over here. Filled with empty wardrobes and empty crates, there really isn't much to see here! The occasional ghost wanders over here, but aside from that, there's little significance to these rooms. This odd professor has created some odd inventions. There's portals that split open the seams of reality and other strange machines. One of his inventions accidentally changed Ernest into a chicken! If you complete the Ernest the Chicken quest, you can transform him back into a human. As mentioned previously, there is a vampire in the basement. 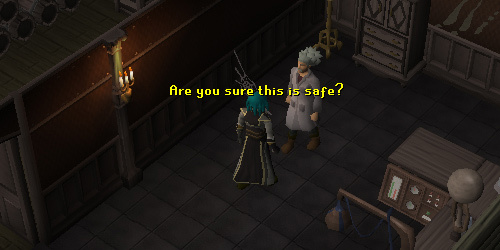 Killing the vampire is how you complete the Vampire Slayer Quest. 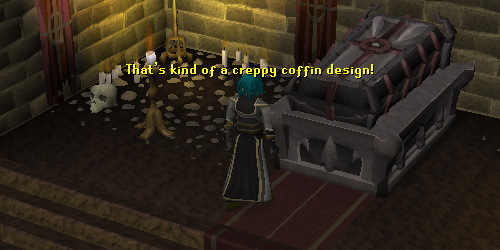 Once the coffin is opened, the vampire will come out and attack you. 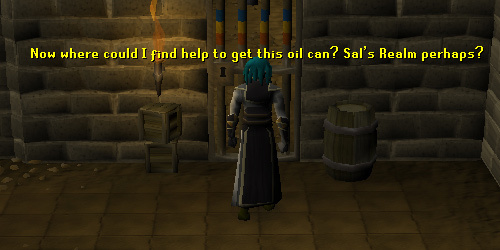 If you've completed the quest, however, you have nothing to worry about! Also, try to avoid stepping on the candles. They will cause damage! In order to get to this part of the basement, you are going to have to climb down the trapdoor in the room located at point 8. The main attraction is the Oil Can, which is an item needed in the Ernest the Chicken quest. It's behind locked doors. All of the other 'cells' are locked as well. It's an elaborate system of levers to open up other doors.